﻿﻿One week of school holiday almost over, and I haven’t done anything, as proof that I really can be more productive during vacation. Usually, I always be busy at work, and use it as a an excuse for doing nothing. Well, this holiday, just combine with new year event, made me declare myself, that I HAVE TO produce something. Thank God, having internet connection at home-made me able to explore the cyber world, took me to new links to some interesting websites. One of the sites I saw was the sew, mama, sew. 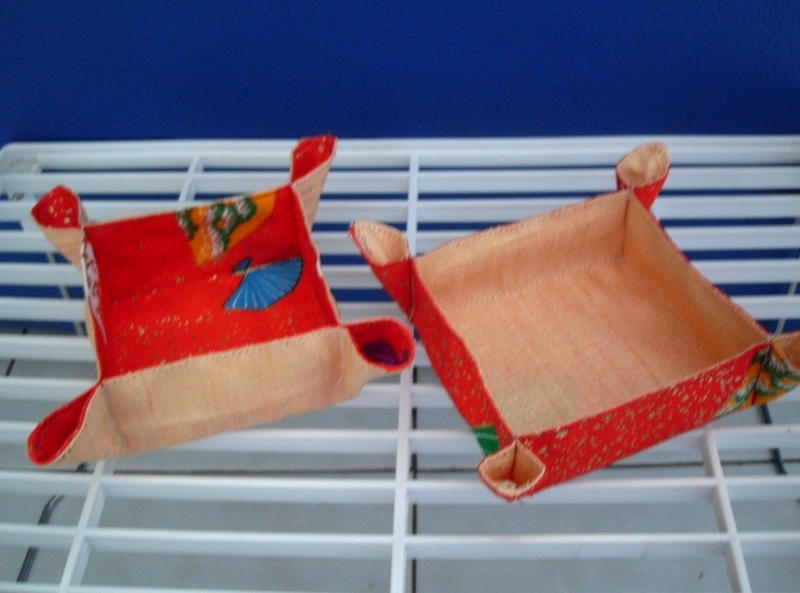 There is a beautiful fabric handicraft products, which seems easy to make. They named it the Happy Hostess Gift Box. I didn’t wait for long. Soon I left the computer screen to get to my sewing machine. 1. Cut two pieces of fabric at the same size. It will be better to have them in different motives to make it more attractive. 2. Sew all four sides, let about 3 cm not to be sewn on one side. 3. Flip the fabric, make the inside part come out (through the section that is not sewn in step 2 above). 4. Sew the fabric with a distance of about 1 mm from the edge. 5. Sew all four sides of the cloth with a distance of 2-3 cm. Suggestions: It’s better to apply a layer of harder cloth inside to make the shape more solid. The result of my work did not use that layer, and the results were not very satisfactory, although not exactly disappointing as well. This entry was posted in Diary, How to... and tagged Achievement, artwork, craft, holiday, postaweek2011, recycle. Bookmark the permalink.